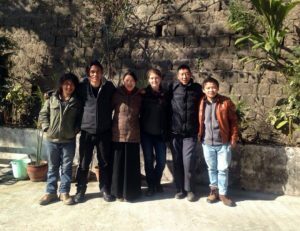 Alisa Webber completed her fellowship in Dharamsala, India in Fall 2015. It was an honour to spend 9 weeks with the Tibetan Centre for Human Rights and Democracy (TCHRD) in Dharamsala, India in the fall of 2015. The TCHRD is a dynamic organization committed to exposing the human rights conditions in Tibet. The TCHRD also promotes human rights and democracy initiatives locally and internationally. As a research fellow, my primary task was to draft a chapter for TCHRD’s 2015 Annual Report on the state of human rights in Tibet. I faced a steep learning curve in a variety of topics, including Tibetan history, international human rights law, Chinese domestic and international policy and the current situation in Tibet and for those in exile. I regularly had opportunities to attend other TCHRD initiatives such as seminars, workshops and press conferences. A highlight was working alongside the TCHRD staff – a warm, knowledgeable and passionate group who generously shared their personal exile journeys with me. Living in Dharamsala, the home of the Dalai Lama and the Tibetan government-in-exile, brought my research to life. The combination of research, writing and participation made this fellowship a rich experience. I was moved by the passion and persistence of the Tibetan movement. Thank you to The Forgotten International and the TCHRD for this opportunity.